A stunning converted barn with characterful oak beams throughout and a vaulted first floor ceiling. Barn Cottage was originally built as a store and press for cider apples before its painstaking conversion in 2011. 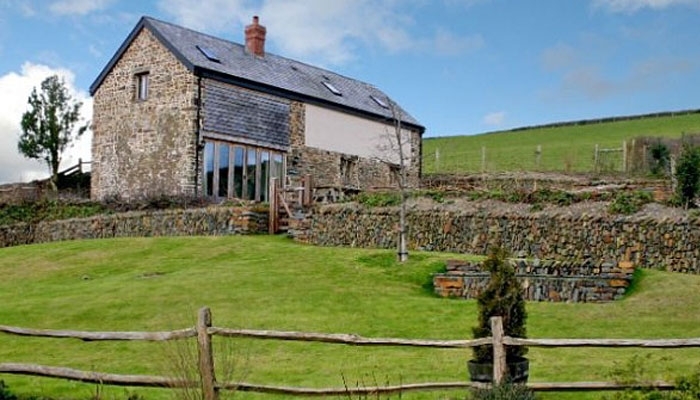 It sits on its own above the farmstead and benefits from glorious country views. The barn was completely rebuilt using traditional cob and stone and nestles under a traditional slate roof. The accommodation on the ground floor comprises a large open plan kitchen and dining area, a twin/double bedroom (zip and link type beds) with ensuite shower room and a separate “snug”. A widescreen television, with separate DVD player, complements the snug which also benefits from a woodburing stove. The first floor, accessed by an open tread oak staircase, comprises two bedrooms and a large family bathroom (with powerful shower over bath). One of the upstairs bedrooms has a double bed with the other having the flexibility of zip and link type beds. The kitchen is equipped with a large electric range cooker, separate fridge and freezer, dishwasher and microwave. Outside there is a garden with a large terrace and seating area and a barbeque. (Please note that the beds in the downstairs bedroom are standard 2'6" beds, giving a 5' double, but are best suited for children when made up as singles). Amenities: adjacent parking for up to two cars, bed linen, towels, electric, central heating and initial supply of logs included. Wi-Fi broadband access is available free of charge and there is good mobile telephone reception for all major operators. Barn Cottage is a no smoking building.